Renamed Iconia, the ambitious Puerta Guadalajara development project that was abandoned last year has been revived by new investors. 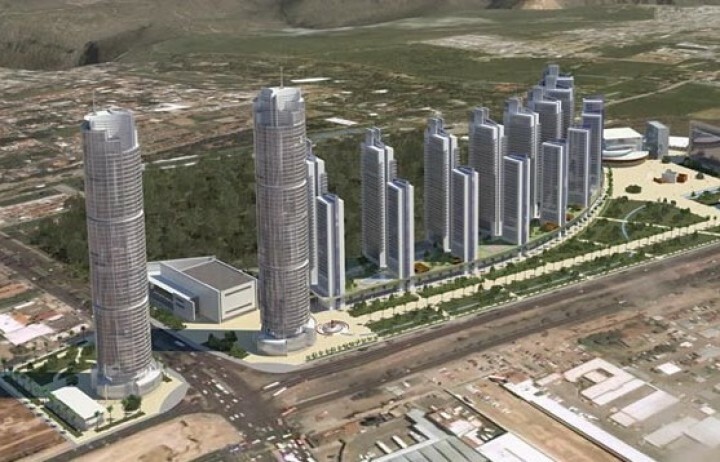 If Guadalajara’s municipal government provides a new license for this four-billion-peso real estate project then construction could begin as early as next month at the 13-hectare plot beside the Calzada Independencia and the Periferico beltway. The land was first gifted to the Spanish consortium Mecano America by the Alfonso Petersen Farah administration in 2008 in return for a pledge to invest 668 million pesos in public infrastructure. But the project was cancelled late last year after Mecano America filed for bankruptcy and anonymous new investors stepped in, violating the original terms of the concession. The plans have now been resurrected, with ICD Sitra, Comercial Hotelera Mexicana de Occidente, Inmobiliaria Caribeña de Desarrollo and Inmobiliaria Constructora y Desarrolladora having all signed up to invest in the project in February. “We’re thinking of beginning the construction of two apartment blocks in mid-October or early November,” said Rafael Garcia, commercial director of Grupo Guia Excelencia Inmobiliaria, which, along with Cordial Inmobiliaria, represents the new investors. The developers must first meet the approval of Guadalajara Mayor Ramiro Hernandez, who is currently reviewing the plans and insists that there is still no agreement in place regarding the terms of a new concession to the land. Mecano America had been committed to building a museum, a school and a new Red Cross facility, as well as renovating Guadalajara’s Planetarium and reforesting the Barranca Huentitan, but Hernandez believes the new developers’ obligations should be different. The Guadalajara Department of Public Works has suggested that under any new concession the developers will have to commit 580 million pesos to public infrastructure and the renovation of the Planetarium. Under the terms drawn up by the department, the latter would be redeveloped and renamed the Museo de Ciencia y Tecnologia at a cost of 100 million pesos. The developers would have to spend another 75 million pesos on beautifying the Calzada Independencia and the Periferico, 20 million pesos on renovating eight public spaces and five million pesos on installing new sports facilities. Further investment would also be required in underground infrastructure and urban renewal in the impoverished local neighborhoods. If given the go-ahead, the Iconia complex will consist of 18 towers blocks housing 1,872 apartments; a 12-story, four-star hotel; a three-story corporate building with 62 offices; a shopping mall; a public museum; an expo center; a linear park and an underground parking lot with 7,465 spaces. The original Puerta Guadalajara project was expected to create 10,000 direct jobs and 20,000 indirect jobs.